Fig. 7-4. Earth Coverage Geometry. A is the off ground track angle and 2 Am^is the swath width. P is the target or ground station. which is equivalent to Eq. (5-49). Note that here we use A rather than A^ for the off ground-track angle and that Av is one half of the true anomaly range (i.e., angle along the ground track) over which the point P is in view by the satellite. See Fig. 5-17 in Sec. 5.3.1 for the geometry of this computation. Formulas for other patterns are in Table 7-2. Again note that because of the curvature of the Earth's surface, this area access rate is not equal to the diameter of the access area times the subsatellite point velocity. * As indicated previously, this estimate would be substantially improved if the 10 deg elevation angle was at the center of the beam. However, we would then need to keep track of beam-center parameters for the geometry and beam-edge parameters for performance estimates. Eqs. (5-24), (5-26), and (5-27) we determine XF0 = 31.43 deg and 28.24 deg. The footprint width from Eq. (7-2a) is 77 km. From Eq. (7-3) the footprint area is 21,470 km2. The accuracy of the area is proportional to 1 - (77/6,378) / sin (77/6,378) = 0.002%. The ground track velocity is the circumference of the Earth divided by the orbit period (from Eq. 7-7) = 40,075 km/127 min = 315.6 km/min = 5.26 km/s. Multiplying this by the footprint height of 355 km gives a crude estimate of the area coverage rate of 1,867 km2/s. Using the more accurate formula in Table 7-2 (Pattern D) and the values of A above, we obtain a more accurate value of ACR = 2.556 x 108 x (sin 31.43 deg - sin 28.24 deg) / (127 x 60) = 1,620 km2/s which implies ah error of 15% in the less accurate approximation. The above formulas are in terms of off-ground-track angle, which is computationally convenient But we often need to know the coverage as a function of latitude. Lot, for a satellite in a circular orbit at inclination, i. We assume that the pattern of Fig. 7-3 A applies and that observations can be made at any off-track angle less than or equal to X^ on either side of the satellite ground track. We also assume that Lot is positive, that is, in the northern hemisphere. (The extensions are straightforward for the southern hemisphere or nonsymmetric observations.) 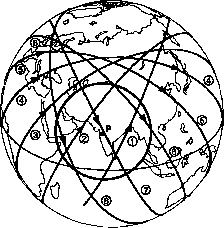 Depending on the latitude, there will be either no coverage, a single long region of coverage, or two shorter regions of coverage for each orbit as follows (See Fig. 7-5). Fig. 7-5. Single Orbit Coverage Is a Function of Latitude, Orbit Inclination, and Swath Width. See text for formulas. where the minus sign applies for <¡>j and the plus sign for Here 0 is one-half the longitude range over which coverage occurs. The formula in the third column above represents the fraction of all points at a given latitude in view of the satellite during one orbit This is approximately equal to the fraction of orbits that will cover a given point at that latitude. As an example of the above formula, consider a satellite in a 62 J-deg inclined orbit which can see to an off-ground-track angle, Xmax = 20 deg. At a ground station latitude of SO deg, the percent coverage will be 49.3%. On any orbit, 49% of the points at a latitude of SO deg will be within view of the satellite at some time. Conversely, a given point at S0-deg latitude will be covered at some time on approximately 49% of the satellite oibits. Because there is only one coverage region, the covered orbits will occur successively during the day. If the satellite orbit period is 2 hr, then our hypothetical ground station at 50-deg latitude will typically see the satellite on 6 successive orbits followed by 6 orbits of no coverage. The number and duration of coverage passes on a given day will depend on where the ground station is located with respect to die orbit node. As a final example, consider a satellite in a 1,000-km circular orbit at an inclination of 55 deg. From Eq. (5-24), in Sec. 52, p = 59.82 deg and from Eq. (7-7) the orbit period is 105 min. We assume that the satellite can make observations out to a spacecraft elevation angle of 10 deg as seen by the target, corresponding to a nadir angle T]max= 58.36 deg from Eq. (5-26) and maximum off-track angle, ?i7nax = 21.64 deg from Eq. (5-27). From Eq. (7-10), the potential area search rate is 1.8 x 106 km2/min. From Eq. (7-9) a point 15 deg from the ground track will remain in view for 9.2 min. Finally, from Eqs. (7-11), a satellite in such an orbit will see 45.7% of all points at a latitude of 50 deg and 33.4% of all points at a latitude of 20 deg. The analytic formulas above provide an easy and rapid way to evaluate Earth coverage, but this approach has several limitations. It does not take into account non-circular orbits, the rotation of die Earth under the spacecraft, or possible overlapping coverage of several satellites. Although we could extend the analytic expressions, numerically simulating the coverage is a better approach for more complex situations. Any modern office computer can do a simple simulation that takes these effects into account with sufficient accuracy for preliminary mission analysis. Analytic approximations also do not allow us to assess coverage statistics easily. For example, while we can determine the coverage time for a given orbit pass, we cannot easily compute how often we will see a given point or where regions of coverage or gaps between coverage will occur. We usually need these statistics for Earth observation applications. Numerical simulations of coverage can become extremely complex. They may consider such activities as scheduling, power and.eclipse conditions, and observability of the target or ground station. Chapter 3 briefly describes an example. In the following paragraphs we will consider two simple simulations of considerable use during preliminary mission design. The heavy circle on Fig. 7-6 represents the subsatellite points corresponding to spacecraft elevations, e, greater than 5 deg (equivalent to Xmax < 25.6 deg). For die 25-deg latitude shown, we can see by inspection that we will see the point P on either two or three successive upward passes and two or three successive downward passes. The downward coverage passes will normally begin on the fourth orbit after the last upward coverage pass. Individual passes within a group will be centered approximately 105 min apart and will be up to 105 x 51.2/360= 14.9 min long. Fig. 7-6. 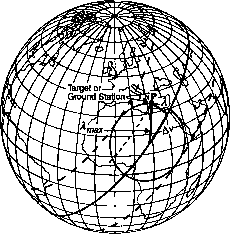 Ground Track of 8 Successive Orbits (out of 14 per day) for a Satellite at 1,000 km. 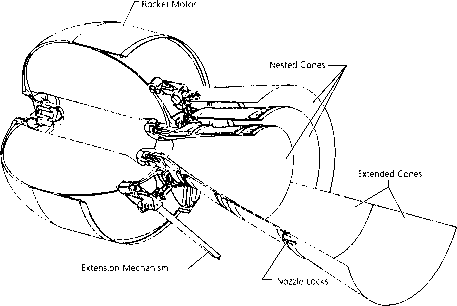 The heavy circle covers subsatellite points over which spacecraft will be at an elevation angle, e, greater than 5 deg. See text for discussion. The details of each day's potential observations will depend on how the orbit falls relative to the point P. However, the general flow will be as follows. Two or three passes of approximately 12 min each will occur 105 min apart (Twelve minutes is estimated by inspection relative to the maximum pass duration of 15 min.) After a break of 5 hr, there will be another group of 2 or 3 passes. The process will repeat after a break of 12 hr. Though we would like to have more statistical data, the ground track analysis can rapidly assess performance, represent the coverage distribution, and crosscheck more detailed results. From this process we could, for example, generate timelines for the most and least coverage in one day. The next step in the numerical modeling hierarchy is a point coverage simulation. To do this, we conceptually create a grid of points on the surface of the Earth, fly one or more spacecraft over the grid, and track the observation characteristics for each of the grid points. We can then collect and evaluate data over different geographical regions. The most common way is to collect data along lines of constant latitude and present statistical coverage results as a function of latitude. This type of simulation is an excellent way to evaluate coverage statistically. The main disadvantage is that it does not let us see the problem physically or admit the general analytic studies stemming from the formulas of Sec. 7.2.1. Thus, the best choice is to evaluate coverage by combining analytic formulas, ground trace plots, and numerical simulations. Although the technique for the numerical point coverage simulation is straightforward, the analyst must be aware of three potential pitfalls. 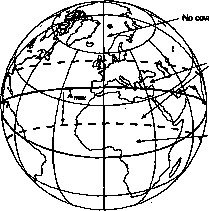 First, if we want to compare coverage performance at different latitudes, then we need to have grid points covering approximately equal areas over the surface of the globe. If grid points are at equal intervals of latitude and longitude, (at every 10 deg, for example), then the number of points per unit area will be much greater near the poles, thus incorrectly weighting polar data in the overall global statistics. We can easily resolve this artificial weighting by using grid points at a constant latitude spacing with the number of points at each latitude proportional to the cosine of that latitude. This covers the globe with an approximately equal number of points per unit area and properly balances the global statistics. Our second problem is to adjust for gaps where the simulation begins and ends. Otherwise, these gaps will make gap statistics unrealistic because true gaps and coverage regions will not begin and end at the start and end points of the simulation. The easiest solution is to run the simulation long enough that start and end data have minimal impact on the statistics. Statistical analysis of inherently nonstatistical data, such as orbit coverage, can lead to dramatically incorrect conclusions. Simple techniques such as ground track analysis are imperative to understand and validate the conclusions we reach. The percent coverage for any point on the grid is simply the number of times that point was covered by one or more satellites divided by the total number of simulation time steps. It is numerically equal to the analytically computed percent coverage in Eq. (7-11). The advantage of percent coverage is that it shows directly how much of the time a given point or region on the ground is covered. However, it does not provide any information about the distribution of gaps in that coverage. The mean coverage gap is the average length of breaks in coverage for a given point on the simulation grid. To compute gap statistics, we must have three counters for each point on the simulation grid. One counter tracks the number of gaps. A second tracks total gap duration. The third tracks the duration of the current gap and is reset as needed. During the simulation, if no satellite covers a given point on the grid, we increment the gap length counter (3) by one time step. If the point is covered but was not covered the previous time (indicated by a value of the gap length counter greater than 0), then we have reached the end of an individual gap. We increment the counter for the number of gaps (1) by one and add the gap duration to the total gap counter (2) or incorporate it in other statistics we want to collect The final mean coverage gap is computed by dividing the total gap length by the number of gaps. As noted above, what happens at the beginning and end of the simulation influences all statistics relating to gap distribution. The time average gap is the mean gap duration averaged over time. Alternatively, it is the average length of the gap we would find if we randomly sampled the system. To compute the time average gap, two counters are required—one for the current gap length and one for the sum of the squares of gap lengths. During the simulation, if no satellite covers a given point on the grid, add one to the current gap length counter. If the point is covered, square the current gap length, add the results to the sum of die squares counter, and reset the current gap length counter to zero. (If the current gap length counter was previously 0, then no change will have occurred in either counter.) The time average gap is computed at the end of the simulation by dividing the sum of the squares of the gaps by the duration of the simulation. The mean response time is the average time from when we receive a random request to observe a point until we can observe it If a satellite is within view of the point at a given time step, the response time at that step will be 0. * If the point in question is in a coverage gap, then the response time would be the time until the end of the coverage gap. In principle, response time should be computed from a given time step to the end of a gap. But by symmetry we could also count the time from the beginning of the gap—a computationally convenient method with the same results. Thus the response time counter will be set to 0 if a point is covered at the current time step. We advance the response time counter by one time step if the point is not now covered. The mean response time will then be the average value of all response times for all time steps. This Figure of Merit takes into account both coverage and gap statistics in trying to determine the whole system's responsiveness. As shown below, the mean response time is the best coverage Figure of Merit for evaluating overall responsiveness. To illustrate the meaning and relative advantages of these Figures of Merit, Fig. 7-7 diagrams a simplified coverage simulation from three satellite systems: A, B, and C. These could, for example, be three sample FireSat constellations. Our goal is to see events as quickly as possible, and therefore, minimize gaps. Constellation B is identical to A except for one added gap, which makes B clearly a worse solution than A. C has the same overall percent coverage as A, but the gaps are redistributed to create a rather long gap, making C the worst constellation for regular coverage.